Published Apr 1, 2016 by Prentice Hall. Android App Development Fundamentals 3/e uses Paul Deitel's unique "app-driven" approach to get you up and running quickly with Google's popular Android 6.0 SDK (Marshmellow). Paul Deitel–best-selling author and Oracle® Java™ Champion–carefully introduces you to Android app development with key Android 6.0 features and APIs. You'll first learn how to install and configure Google's Android Studio IDE. Using the Deitel's signature App-Driven Approach in which all concepts are presented in the context of complete working apps, you'll then build seven Android apps that introduce everything you need to start creating your own–Welcome app, Tip Calculator app, Flag Quiz app, , Doodlz drawing app, Cannon Game app, WeatherViewer app, Twitter Searches app, and Address Book app. Along the way, you'll lean to master the Android APIs and FrameWorks needed to become a successful Android app developer. Paul Deitel is the co-founder of Deitel & Associates, Inc., the internationally recognized programming languages authoring, corporate-training and Internet business development organization. Paul and his father–Harvey Deitel–have written many international best-selling programming-language professional books and textbooks that millions of people worldwide have used to master C++, C, Java™, C#, Visual Basic®, Visual C++®, XML, Perl, Python, and Internet and web programming. This lesson shows you how to install and configure Android Studio, Google's Android Integrated Development Environments (IDE). In this lesson you’ll run and interact with your first Android app using an Android Virtual Device and, if you have one, an actual device. 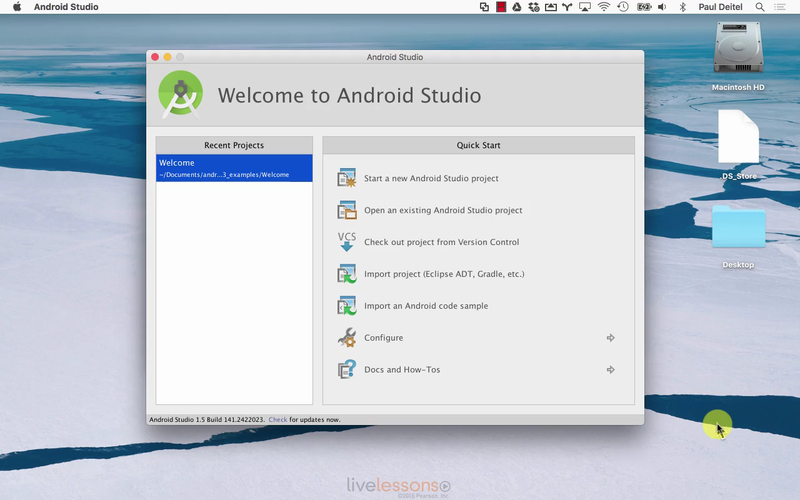 This lesson shows you how to use Android Studio to create a graphical user interface (GUI). You also learn about accessibility and internationalization. In this lesson you learn to use various Android classes to create objects, call methods on those objects, define and call your own methods, and explore both inheritance and exception handling in Android. Among the key skills you'll acquire in this lesson are how to use Fragments to make better use of available screen real estate, display an options menu, manage user preferences, organize an app's assets, support multiple device orientations and use Android's logging mechanism to log error messages. This lesson shows you how to create a drawing app. You learn to detect when the user touches the screen, process multiple touches, use the accelerometer to detect motion events, draw lines, create and display menu items on the app bar, and use Android 6.0's new permissions model. This lesson shows you how to create a simple game app that's easy to code and fun to play. In it you learn how to display the game's graphics, draw on screen, fire a cannonball, perform collision detection, and add sound to your game. This lesson shows you how to use web services in your apps. The app- uses the free OpenWeatherMap.org REST web services to obtain a specified city’s 16-day weather forecast. The app receives the weather data in JSON format. It uses a ListView to display the data in a scrollable list of items. This app allows you to save your favorite Twitter search queries with easy-to-remember short tag names. The app allows you to share, editand delete saved searches. You learn to support both portrait and landscape orientations by designing a GUI that dynamically adjusts, based on the current orientation. The Address Bookapp provides convenient access to contact information that’s stored in a SQLite database on the device. You can scroll through a contact list, view details, and add, edit, or delete contacts. The app provides a separate tablet layout that always displays the contact list in one third of the screen and uses the screen’s remaining two thirds to display either the selected contact’s data or the screen for adding and editing a contact.